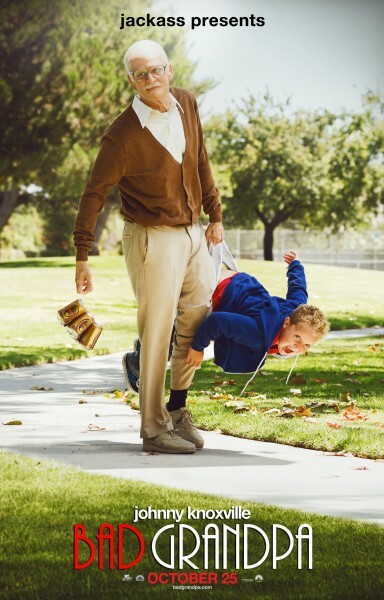 It’s damn hard to describe a movie like “Bad Grandpa”. It’s not exactly stupid. I mean who else would have thought of releasing a one joke movie based on Johnny Knoxville’s 86 year old character from the Jackass series? Daring might be a better word. Or even inspired, as long as your definition of inspiration includes an old man shitting himself in public. You have to give Knoxville credit, not only for audaciousness (for more proof see the first three “Jackass” films), but for his complete commitment to the character he portrays here. The movie has him traveling across the country to deliver his eight-year-old grandson, Billy (a solid Jackson Nicoll), to his father when the mother goes to jail. But truth be told, Knoxville and his writers are better served by short-form ideas like the ones they hatch so successfully on “Jackass”. Not every idea is fruitful enough to deserve a feature-length film, and this is one of them. Audiences who are eager for laughs may rate this “funny enough,” which is exactly the problem with comedies these days. Personally, I think we deserve better from the Jackass crew. But that’s just me.